In 2006, Russian nationalist historian Mikhail Smolin condemned former Ukrainian President Leonid Kuchma’s book Ukraine is not Russia, arguing that Ukraine was a 'sickness,' and Ukrainians were 'South-Russian separatists,' 'traitors to Orthodox civilisation and Russian unity.' To a greater or lesser extent, this view of the Ukrainian people is shared by the entire Russian political establishment and underpins many of the Kremlin’s responses to developments in Ukraine. The notion of 'Russian unity' or russkiy mir (literally, Russian world) would seem to imply the existence of a transnational community of people and societies committed to Russian culture and language. The idea was adopted by Putin as early as 2006, and is obviously imperialistic, but it also reveals a deeper and probably more important insight into Moscow's domestic and international politics. Since Putin’s regime correctly recognised Western-style liberal democracy as an existential threat to the well being of its elites (not the people), it has crushed democracy in Russia and successfully convinced a large number of Russian people that Western-style democracy is destructive (look back at the 1990s, they say) and essentially alien to them. To compensate for the rejection of liberal democracy and, therefore, becoming part of the West, the Kremlin and its loyal opinion-makers have offered the Russian people the belief that they are a unique civilisation in its own right: you do not need Western values because you are different; Russian culture is not only different but superior to Western culture. Russkiy mir is an, 'unwesternisable' and 'unmodernisable' community. Moscow proclaimed the uniqueness of Russian culture to justify both the rejection of Western-style democracy and Western modernisation. But the Kremlin – unlike China – has failed in its attempts at authoritarian modernisation, and Russian culture, as intrinsically understood by Putin’s regime, is about not modernising at all. Russkiy mir is an, 'unwesternisable' and 'unmodernisable' community. This is why Putin’s Russia is not fascist, as some commentators suggest: both Mussolini’s Italy and Hitler’s Germany strove for an alternative modernity rather than rejecting the idea of modernisation altogether. Obviously, no society should be forced to modernise along Western lines unless it so wishes. However, the danger of the Kremlin’s 'non-modernisation,' driven by the elites' urgent need for self-preservation, is that it clashes with Russia’s natural progress towards social modernisation, which is determined by globalisation. Thus, the Kremlin’s 'non-modernisation' agenda is not only to conserve the existing traditionalist elements of Russian society, but also to suppress those who embrace Western-style modernisation. This suppression has resulted in almost all the social conservative policies that Putin’s regime has produced so far, showing disdain for – if not openly persecuting – human rights and environmental activists, social, cultural and sexual minorities, progressive artists and musicians, etc. Another danger of the Kremlin’s refusal to modernise is that the uniqueness of the 'unwesternisable' russkiy mir needs constant corroboration, meaning that hindering the progress of Westernisation and democratisation in the countries that are allegedly part of russkiy mir is crucial for continuing to substantiate the 'non-modernisation' thesis to the Russians. Putin’s attempts, first to sabotage Ukraine’s democratic revolution, and then to undermine the country’s post-revolutionary development were aimed at Russian citizens, to prevent them from observing Ukraine’s successful democratisation; otherwise, if those Little Russians did it, why can’t we? It is essential to stress that russkiy mir is not a community of ethnic Russians or societies committed to Russian culture. The Kremlin’s flirtation with Russian nationalism, although convincing, is inherently a means to secure the rule of the political and financial elites in Putin’s Russia. To be part of russkiy mir is to fit their agenda: disdain for liberal democracy, suppression of human rights, and undermining the rule of law. This explains why liberal citizens of Russia, or ethnic Russians in Ukraine who supported the democratic revolution, do not belong to russkiy mir; they are 'national traitors' or 'Russophobes.' It also helps to explain why the defenders of russkiy mir in Eastern Ukraine are racists and homophobes; and why the best friends of russkiy mir in the West are corrupt politicians and undemocratic political parties. Russkiy mir is not a community of ethnic Russians or societies committed to Russian culture. Written in Ukrainian and Russian, comments like these affirm that Ukraine’s departure ('South-Russian separatism') from russkiy mir or the sphere of influence of Putin’s Russia is not about creating an unbridgeable ethno-cultural cleavage between the Ukrainians and Russians. It is about rejecting what Putin’s Russia apparently stands for: intolerance, illiberalism, and isolationism. Unfortunately, the annexation of the Autonomous Republic of Crimea, and the proxy war that the Kremlin has waged against Ukraine in eastern parts of the country have created the conditions for some elements of Ukrainian society to evolve in the direction of russkiy mir. The natural feeling of humiliation deriving from the loss of territory and military failure, resulted in a psychological need for the deceptive comfort of populism and its simplistic rhetoric and actions. Similar attitudes were to be found in Russia after the defeat in the first Chechen war – attitudes that contributed to the rise of Putin. Another presidential candidate, Oleh Lyashko, obtained 8.32% of the votes and finished third. After Ukraine’s presidential election in May 2014, many journalists and experts on Ukraine, who highlighted the pathetic results of the two 'official' far-right candidates, Svoboda’s Oleh Tyahnybok (1.16%) and Right Sector’s Dmytro Yarosh (0.70%), completely ignored the strong electoral performance of another presidential candidate, Oleh Lyashko, who obtained 8.32% of the votes and finished third. 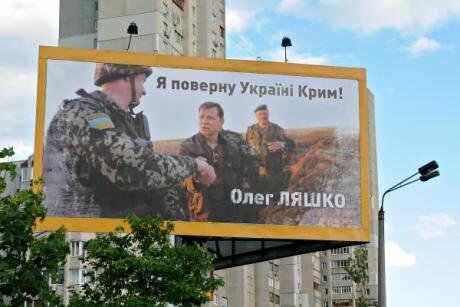 In his political programme, peppered with 23 exclamation marks, Lyashko presented a textbook example of unabashed populism, while, during his campaign, he postured in a military uniform promising to 'return Crimea to Ukraine!' In the run-up to the presidential election, Lyashko praised militarism and bragged about unlawfully questioning a captured separatist. However, not only have the Ukrainian authorities ignored Lyashko’s criminal actions, but society has largely failed to condemn his behaviour. Lyashko's Radical Party nominated several SNA members as candidates in the May 2014 Kyiv city council elections: Oleh Odnorozhenko (its ideologue), Ihor Mosychuk, Ihor Kryvoruchko, and Volodymyr Shpara. It seems plausible to suggest that SNA members will also be included in Lyashko’s party list in the early parliamentary elections possibly taking place in autumn 2014. The Azov battalion includes members of Misanthropic Division, an international neo-Nazi movement. The SNA’s participation in the ATO in Eastern Ukraine, and Lyashko’s cooperation with the neo-Nazis, run in parallel with mainstream Ukrainian media according the SNA a degree of legitimacy by proclaiming them 'defenders of the Ukrainian motherland.' They are almost never presented to audiences as SNA members, but specifically as fighters of the Azov battalion. In the same manner, RT (formerly Russia Today) presents members of European far-right parties who support the Kremlin’s agenda, as simply European politicians, without mentioning their undemocratic doctrines. Recently, SNA members have appeared on Ukrainian TV, and interviews with them have been published by respected media outlets. Their ideology was very rarely questioned although sometimes they took the liberty of appearing on TV wearing clothes with dubious symbols. Regretfully, the same media that provided objective coverage during the Maidan revolution were now legitimising the SNA by refusing to regard their ideology and activities as problematic. In one episode, a journalist of Hromadske went so far as to show a video in which Mosychuk was humiliating a captured separatist. Hromadske TV, for instance, invited Biletsky, Mosychuk and Kryvoruchko to its studio as the commanders of the Azov battalion. In one episode, a journalist of Hromadske went so far as to show a video in which Mosychuk was humiliating a captured separatist. The journalist failed to provide even moderate criticism of Mosychuk's actions – in what way was he any different from the Russian state journalists who questioned, detained and abused Ukrainian security officers? In another episode, Roman Skrypin, a journalist for Hromadske, evidently unwillingly asked Biletsky, who was wearing a black paramilitary polo with a chevron saying 'Black Corps' – a clear reference to Das Schwarze Korps, the official newspaper of the SS – about the claims that the SNA was a neo-Nazi movement. When Biletsky, for obvious reasons, decided not to give a direct answer, Skrypin disavowed his question. Russia’s proxy war against Ukraine now serves as a perfect excuse for legitimising the fringe Ukrainian neo-Nazis as 'defenders of the Ukrainian motherland.' Those who are involved in this process – especially the Ministry of Internal Affairs that arm them and Ukrainian mainstream media that uncritically take their 'patriotism' at face value – fail to understand that neo-Nazis pose a real threat to Ukrainian society. 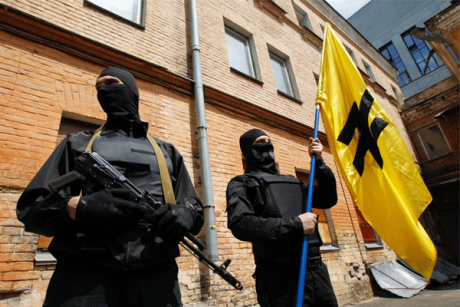 Neo-Nazis pose a real threat to Ukrainian society. The Constitution of Ukraine unequivocally states that 'Ukraine is the sovereign and independent, democratic, social, legal state' (Article 1). For some Ukrainians, the Russian threat to their country’s sovereignty and independence has obscured the rationale of being sovereign and independent – that is to secure the democratic, social and legal state. Furthermore, the Constitution unambiguously recognises, 'the human being, his or her life and health, honour and dignity, inviolability and security' as the highest social value. At the same time, the main duty of the state is 'to affirm and ensure human rights and freedoms' (Article 3). It is absurd to assume that the neo-Nazis who 'are taking a stand for Ukraine’s independence' are doing this in the name of Ukraine’s highest social values or to reinforce the main duty of the state as stipulated by the Constitution. Rather, they are arming themselves, learning how to fight and kill, as well as recruiting new members. Their 'ideal Ukraine' is not only different, but is the direct opposite of a democratic, social and legal state. To ignore these values, to override them for the sake of sovereignty and independence, is to move closer psychologically in the direction of Putin’s russkiy mir without even acknowledging it. Ukraine’s rapprochement with the EU should mean something different, because EU member states have partially sacrificed their sovereignty and independence at the altar of supranational democracy, more secure social order and the stronger rule of law. In the beginning of July, Mayor of Kyiv Vitali Klitschko used the conflict in Eastern Ukraine as an excuse for discarding what should be the fundamental values of the democratic Ukrainian state. On 5 July, the Ukrainian LGBT community was going to hold a March of Equality in Kyiv, under the slogan 'Ukraine is united and we are part of it,' but Klitschko called for its cancellation on the grounds that 'when military operations are taking place and many people are dying,' it would not be 'appropriate to hold entertainments.' Klitschko seems completely to misunderstand the meaning of democracy: the March of Equality is not an 'entertainment' but a means of drawing attention to the fact that the state should 'affirm and ensure human rights and freedoms' of all its citizens. What will Klitschko do when the neo-Nazi gang from the Azov battalion returns to Kyiv to fight against various 'Untermenschen'? The March of Equality has been cancelled but the reasons for cancelling it are most disturbing: the police told the organising committee that 'they could not secure the safety of participants in the face of expected far-right counter-demonstrators.' What will Klitschko do when the neo-Nazi gang from the Azov battalion – officially armed by the Ministry of Internal Affairs – returns to Kyiv to fight against various Untermenschen? The failure to protect the participants of the March of Equality from Ukrainian right-wing extremists in Kyiv is no different from the failure to protect East Ukrainian civilians from (pro-)Russia separatists, because 'all people are free and equal in their dignity and rights', while 'human rights and freedoms are inalienable and inviolable' (Article 21). Giving in to bullies only makes them stronger; retreating from any enemy of democracy – be they militants of intolerant and isolationist russkiy mir or Ukrainian neo-Nazis – is to open up even more space for injustice, and cede even more territory to anti-European forces. 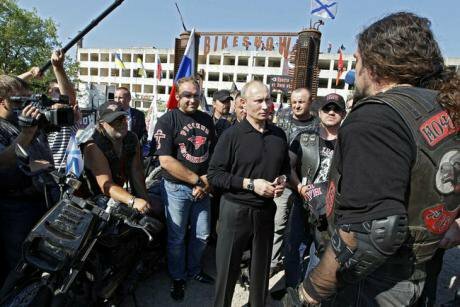 Every time Ukraine’s authorities infringe the rights of its citizens, Putin gives a welcoming smile.